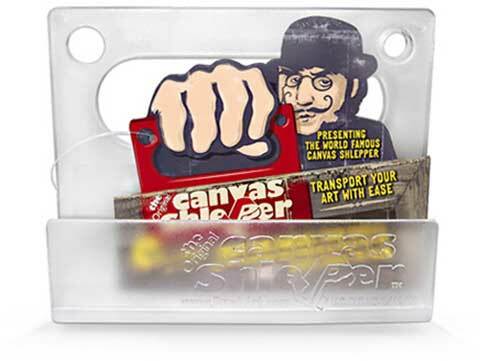 Transport art with ease with this clever plastic canvas carrier, the Canvas Shlepper. Simply clip the Shlepper on a stretcher bar and you've got a convenient handle for canvas. Artists can free up their hands by fastening a strap or rope to the Shlepper. With their uniquely designed snaps, two Shleppers can be snapped together for double the canvas carrying capacity. They're also great for hanging canvas for critiques and studio painting. No tools are needed for assembly or hanging. The Studio Schlepper accommodates canvas with a 3/4" stretcher bar.